When a ferromagnetic is magnetized or remagnetized, the magnetization consists of a discrete set of changes in the form of irreversible magnetization steps varying in size (the Barkhausen effect). The Barkhausen steps are closely related to the interaction of domain boundaries with defects of various kinds (pores, inclusions, second-phase segregations, dislocations, grain boundaries, stress gradients, etc.). As the recorded values for the Barkhausen step parameters reflect changes in the structural state in a ferromagnetic, they can be used in non-destructive testing as well as in analyzing the deterioration in properties during use. Here we take the example of an iron-silicon alloy (Fe+3% Si) as a model for a material having fairly large magnetic domains in order to consider various physical mechanisms of irreversible magnetization steps associated with the reorientation of magnetic domains near various kinds of defects. Fig. 1 shows the transition of a 180° domain boundary in a main banded domain through a defect or inclusion (figs. 1a and 1b) on longitudinal magnetization of a crystal of (100) type. It can be noticed, that the passage of a domain boundary through an inclusion is accompanied by eight successive magnetization steps, which are related initially to the attachment of subregions A and B to the boundary of the main domain, their subsequent detachment from the boundary and a stepwise rearrangement of adjacent subregions. The size of an individual Barkhausen step is largely determined by the size of the defect, by the polarity and the detailed form of domain boundaries as well as by the rate of magnetization . 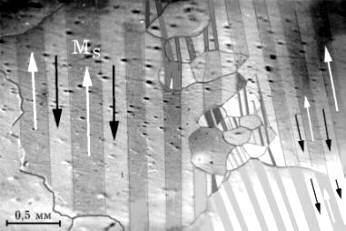 Similar magnetization steps occur in crystal areas with residual internal stresses. As a domain boundary approaches such an area, a stepwise formation of 90° and 180° domain closure regions corresponding to the local zones of compressive and tensile stresses are observed . 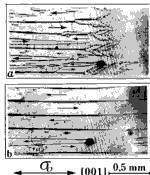 The Barkhausen steps are associated also with the interaction of domain boundaries with s inclusions, i.e. silicate inclusions, the thermal coefficient of expansion of which is 2 or 3 times less than that of steel. Such inclusions produce considerable local compressive and tensile stresses and increase the dislocation density at distances substantially greater than the size of the inclusions . Fig 1: Forms of substructure near a local defect (inclusion) in an Fe-3%Si crystal of (100) type (a); scheme for magnetization distribution and magnetic charges (b); stages in the rearrangement of the subregions as a 1800 domain boundary of the main domain approaches magnetization (c-e) and recedes (f-h). The rearrangement of 90° and 180° magnetic phase volumes due to varying crystallographic orientation and elastic strain of ferromagnetic crystals makes it possible to detect the crystallographic texture (fig. 2) as well as to estimate the value and the character of the anisotropy of mechanical properties, e.g. in tube steels . The correlation of the domain size with the characteristics of crystallites and texture complexes in polycrystals (fig. 3) allows one to inspect the macrostructure of a ferromagnetic by measuring the Barkhausen step parameters, as it was described for iron [4,5]. Fig 4: Rearrangement of a 900 domain structure into a 1800 one in a Fe-3%Si crystal (a) in response to stretching 100 MPa. A combination of tensile and compressive stresses s 0 significantly affects magnetic anisotropy by reducing or increasing the volume of 90° magnetic phase respectively (fig. 4a,b). 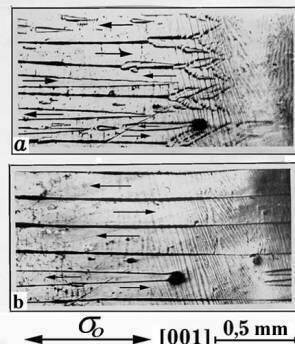 Under the influence of low compressive stresses in each individual crystallite of steel 20 (~0.2%C), a texture is formed (fig. 5a) in which the magnetization vectors are perpendicular to the stress axis, since the magnitostriction constant l 100 and s 0 differ in sign. The increase in the magnetization vector disorientation angles between the individual crystallites can increase the irreversible displacement of the 90° domain boundaries and the longitudinal magnitostriction l II. As the perpendicular texture is formed, it becomes difficult for magnetization reversal to occur on account of the displacement of the 180° domain boundaries, and this is reflected by the reduction in Ubs and B~ . Compressive stresses greater than 60MPa increase the reversible rotation, which deflects the magnetization vectors from the tetragonal axes of the crystallite towards the direction perpendicular to the compression axis (l 111 and s 0 are of the same sign), and this reduces l II and B~, leaving Ubs almost unaltered (fig. 5a). 1) H~ = 8, 2) 32, and 3) 48 A/cm. For low elastic tensile stresses, the 90° junctions between domains are replaced by 180° ones, so a texture will arise in the crystallites in which the magnetization vectors are directed along the easy magnetization axes closest in direction to the tension. It has been shown that the area of the 180° domain boundaries increase, thus facilitating the reversal and increasing Ubs and B~ (fig. 5a). However, as l 111< 0 for steel, so the magnetization vectors will deviate from the tetragonal directions in the crystallites towards a plane perpendicular to the tension axis for sufficiently large tensile stresses s 0 ³ 60MPa, and then the sign of the longitudinal magnetization alters. This deviation of the magnetization vectors is accompanied by a reduction in the maximal induction, but it does not influence the Barkhausen step parameters. Thus in a steel with positive magnitostriction the compression reduces the Barkhausen step parameters, while conversely, stretching increases them, as in the case of increased sharpness in the crystallographic texture. However, for large elastic strains, where the magnetization vectors deviate from the tetragonal directions in the crystallites, the Barkhausen step parameters are not very sensitive to the elastic strains. The magnitostriction parameters for nickel (l 100 and l 111<0) are negative, so compressive and tensile elastic stresses should cause reverse changes in the magnetic parameters as compared to those for steel 20 (Fig. 5b). A direct correlation between the parameters and behavior of the domain structure on the one hand and changes in the crystallographic and structural state of a ferromagnetic on the other hand has been established for the influence of various external factors. When a ferromagnetic is magnetized or remagnetized, the relationship between domains and material structure is revealed by the interaction of moving domain boundaries with domain segregations on local defects as well as by the generation and annihilation of new domains. Reliable non-destructive testing of the material structure, quality and deterioration of properties during use substantially depends upon the intelligent choice of the parameters of the Barkhausen step flux caused by the interaction of domain boundaries with magnetic imperfections. Gorkunov E.S., Dragoshansky Yu.N. Russian JNDT, 1999, N6, p. 3-23. Gorkunov E.S., Dragoshansky Yu.N., Rodionova S.S. RJNDT, 1998, N6, p. 42-59. Dhar A., Jagadish C., Atherton D.L. Mater. Evaluation, 1992, N10, p. 1139-1141. Gorkunov E.S., Dragoshansky Yu.N., Mikhovski M. RJNDT, 1999, N8, p. 3-25. Deimel P., Rode B., Trentini G. JMMM, 1977, N4, p. 235-241. Gorkunov E.S., Dragoshansky Yu.N., Mikhovski M. RJNDT, 1999, N7, p. 3-32.